A new book captures their strange appeal. 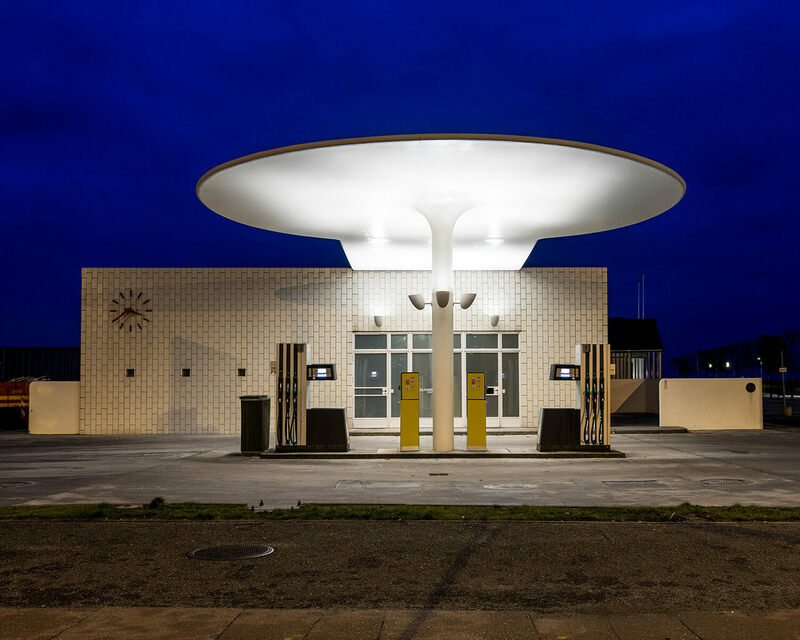 The Skovshoved gas station, in Denmark, is an unbelievably glamorous-looking place to fill up your car. Designed by Arne Jacobsen, it features an elegant, rounded concrete awning, which is supported by a single column. Gas pumps sit neatly on either side. The main building is covered in white ceramic tiles, and its only decoration is a large clock face. Gas stations like this one are a testament to the concept that even the most functional places can be beautiful. While service stations can often be regarded as a soulless necessity—a place to refuel the car and grab a fast meal on the way to somewhere better—Gestalten’s new book It’s a Gas! : The Allure of the Gas Station reveals that these seemingly mundane structures can also be landmarks and architectural icons. The Bomber gas station in Milwaukie, Oregon, was certainly the latter. After World War II, its owner, Art Lacey, purchased a Boeing B-17 Flying Fortress bomber from an Air Force base in Oklahoma. For decades, the B-17 sat perched above the gas pumps, its vast wings providing shade and, of course, a photo opportunity. (The above image was taken by John Margolies, the photographer and notable roadside attraction enthusiast, in 1980.) But today, it’s no longer watching over a gas station—the plane is now being restored with the hope that it will fly once again. In the early to mid-20th century, American gas stations could take quirky forms, everything from teapots to seashells. But today, gas stations in general are in decline. (The Gestalten book includes a section on abandoned gas stations, featuring signs that once beckoned drivers in neon or hand-painted lettering now rusty and faded.) Electric cars need charging stations, not gas pumps. In Europe, Shell has responded by incorporating EV charging facilities into its stations. As electric cars proliferate, traditional gas stations are likely to need a considerable overhaul, and we may need far fewer of them. For now, however, linger over this selection of images from It’s a Gas! Welcome to Jurassic parking lot. A fade to black for America’s outdoor silver screens.